Not that far from where I used to live a few years ago is one of those rather small municipal gardens that pop up from time to time in scraps of land often left over from former industrial works or derelict grand houses that had fallen on hard times. Folkestone Gardens is itself the former land belonging to homes, but less stately and more tenement – which were largely flattened by a German V2 missile on the 7th March 1945, with the loss of 53 lives. In fact it was the second worst loss of life in the area during WW2 – which slightly makes the garden a sort of war memorial. 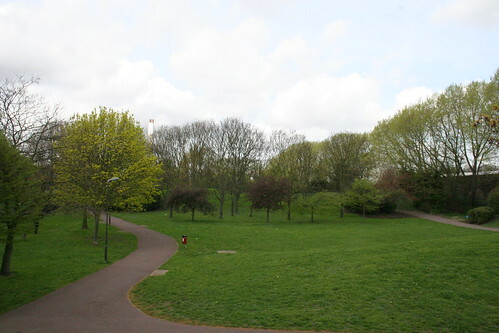 The area is bordered to one side by the railway, and to the other by Trundleys Road. A road to the south, and to the north was the Surrey Canal – now sadly filed in and turned into a high-speed route for motorists. On the night of the attack, two blocks of flats were destroyed as were 5 houses. Ten shops and houses in Trundleys Road had severe damage. 8 railway arches used as spinning mills slight damage. Most of the flats belonged to the Southern Railway and most if not all of the casualties were railway employees or their families. There was also a road running behind the houses, Oareboro Road – and when the area was later re landscaped into a park, that road vanished beneath the rubble of the former houses. This map extract from 1908 shows Oareboro Road running between Trundleys Road to the West and the Railway. Modern map here. Like many parts of London, the area was left empty after the war for several decades, although local children used to play in the bomb site and they held a huge bonfire on the site of the V2 impact each 5th November. Anyway, later the land was later turned into a small park and nature reserve. Unlike many small parks though, this one has some decent sized “hills” that still give you quite a good view of the area from the top. I wonder if they are made from the rubble left over from the destruction of the houses? 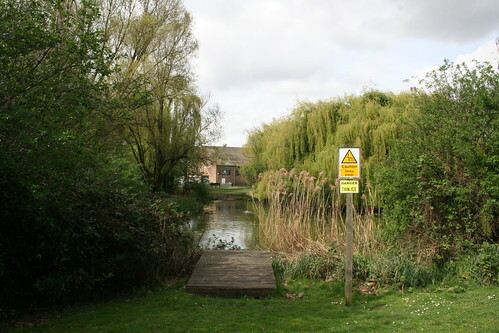 The most important feature of the park is its large pond, which was restored by the Council in 1994, after a serious leak led to the pond drying out. The park is surprisingly quiet for although it is bounded by railways and roads, the conventional background roar of road traffic is not that noticeable, so the main disturbance is from trains interrupting the bird song, and they pass by quite quickly. I am slightly annoyed with myself that I didn’t make more use of the park when I lived nearby – especially feeding the ducks. A few more photos over here. 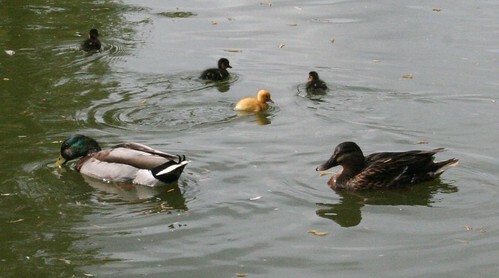 Hurrah, the first ducklings are here! I look every morning as I cycle past but haven’t spotted these yet – very interesting colouring on that little golden one! I cycle through here occasionally on the way to/ from work. The last time I went through it some Millwall fans on the way to a match decided they didn’t like cyclists and tried to push me off as I went past. Also some kids on a motorbike almost had me off my bike one night, so now I avoid it. Sad, as it was a highlight of my commute. How many times did you cycle though without incident though? We shouldn’t allow the occasional bad experience detract from many hundreds of pleasant trips. Very true Ian. I’m going to make a point of going through it tonight! I had no idea about it’s sad history though – the park now takes on a deeper significance. I lived in Folkestone Gardens from 1954 until 1968 and was one of the children who played on the bombsite. In fact although two blocks were flattened by the V2 five remained as did most of Oarboro Rd. I remember there being prefabs on the corner site that had been bombed. I was ony 6 when we moved there and because I’d been on holidays to Folkestone and we shared a garden where we lived in Hither Green I was really excited at moving and remember it was a huge shock when we arrived to find the only garden was a bombsite and to hang out washing mum had to go up onto the roof. The blocks were three storeys high with six flats to each entrance and there were strict rules on which days you could hang your washing out and when it was your turn to wash the stairs down. You even had to have permission for visitors to stay overnight. When we first moved in they still had gas light and a copper boiler and coal cellar in the kitchen. Hi Chris, my family lived in Folkestone Gardens from 1954 to 1967. We lived in the first yard. I too can remember my mum hanging out her washing on the roof also taking her turn to sweep the block. We were quite a large family in a 1 bedroom flat, yet there were some families with only 1 child yet they had 2 bedrooms. We had lots of fun back then, it was a real community spirit, everybody looked out for one another. We had no visitors staying overnight, there wouldn’t have been any room!!!! I was born at 24 Oareboro Rd and my familywas one of the last familes to move out before it was made into the park. I remember we had an outside toilet and it being freezing everytime we wanted to go! Happy memories though from playing out with my sisters and friends. I also now work in the arches there and walk through the park every day. I have definately come full cycle! My grandparents used to live at 35 Oareboro Rd. Thomas & Emily French, they had two children Bob & Gladys. Thank you for this blog post – it has helped me find the location of my half-uncle’s father’s birthplace of 54 Oareboro Road. The address wasn’t easy to read on the birth certificate but eventually the trail brought me to your blog and a very useful map – thank you! If it helps with the house numbers in Oareborough Road Number 35 was next door to the prefabs. The even numbers were opposite and backed on to Folkestone Gardens. I used to live in the prefabs number 6 ,think a family called Rooney lived next to us . Also remember family names ,Bass & Parr.& French. My Grandparents Henry and Clara Kingston lived in the “buildings” at Folkston Gardens. I remember visiting them there as a child. Henry died in 1956, my grandmother continued to live there until her death in 1969. Many happy years were spent playing on the bomb site, annoying the neighbours while playing football in the yard and constantly being told off by the caretaker (Mr Crawley). Both me and my brother Keith were employed as paper boys by Len and May in Newburys. I remember the mornings being icy cold in winter and the letter boxes very small. Fireworks night was always a spectacular event with the bomb site hosting the biggest bone fire in Deptford. I have lasting memories of playing down by the canal, gaining entry to Millwall football ground at half time for free, taking the washing up to the laundry and struggling with it once it had been collected, the smell of the coal on the coalmans lorry and bath night in the tin bath in front of the fire. GOOD OLD DAYS. I and my cousin Brian were the two six year old boys who were the sole survivors of the two blocks of flats that were destroyed by the V2. Nine members of our family died when the V2 hit Folkstone Gardens on 7th March 1945. My Grandmother lived in Oarboro Road in the 1901 census, family of Titler. I think it was a very poor area then. mentioned who lived at no 8 were my mums family. Ihave many happy memories visiting my nan there. Some of tbe names you mentioned are familier to me but I can’t put fa es to the names. I was shocked recently when v,isited the area to fi.d the houses all gone anda park in there place. Hello Ian ,we used to live at no. 231 folkestone Gardens next to the canal, my Dad on many occasions had to pull drunks out of there on their way home from the pub !!! my brother Andrew and sister Moray were born in 231,wonder if anyone remembers us lorraine, malcolm ,louise ,andrew and moray , we only had 2 bedrooms , we were friends with the Colliers, and Pat Belcher ,The Conways bernadette ,gerry,dimpne, and elish , I often wonder what happened to them ,we were poor but happy !!! Hello Lorraine, it’s Gerry Conway here.I couldn’t believe it when I saw your letter!You also won’t believe that I was looking at a photograph of you yesterday.You,Malcolm, Bernadette, me and Stephanie Collier. The photo was taken by Ann McAvoy or her mum Nellie.Do you remember the night Dympna was born.My Mum and Dad sent some of us over to your flat and we spent most of the night jumping on the beds!I lost my sixpence and never did find it.Hope you can reply.Gerry. My name when I lived in Folkestone Gardens was Patricia Ellens. I remember you playing the bagpipes on the roof. I used to play with you and Brian Gaffney. We had roller skates. As you came in the gate I lived in the first block on the right, number 93. One year you spent a long time in Ireland. Where do you live now? I live in Cornwall with my husband and my son, Andrew who is 23. Hi.Gerry,you probably won’t remember me, I was good friends with Norman liggins,Brian and Gerry gaffney and the Ridgway family we all lived in the first yard my family were the first Jamaican family in the flats.what I want to know is did you ever learn to play them bagpipes. Haha.Remember when you used to play them on your roof.one more thing do you remember Maurine deaney? This is dympna Conway aka Dina. I live in Edmonton,Alberta, Canada. I was speaking with my brother Gerry on the phone, and he mentioned this site. Hope you respond. You can email me at dina.plante@gov.ab.ca. My husband’s Great grandfather lived at 15 Oareboro Rd in 1906. His name was Alfred Turner. Sorry, not 15, number 78. We lived at 28 folkestone gardens from 63 to 69. Remember the bonfire nights some names i remember, micheal and sandra lamb, carol nye and her mum kay, veronica simpson, carmen canicle, melonie mall, john donahaugh the irish bloke who drank alot and was always angry, mandy ?, the pitchleys, mark lyndsey and his sister who cant remember name at Mo. Really happy memories of living there in the summer all the mums used to sit on the wall by the railway end of the yard…played round the chicken backs and bombsite. Our block was the first block heading towards oarbora road…used to play on the bars up near the cartakers office as well…family name was payne..
My grand mother lived in “The Buildings” in Trundleys Rd, and my mother, her sister and 4 brothers were all born and lived there as kids. Surname of Gingell. Her youngest brother was drowned playing in the Canal. I remember as a kid (under 11) going back to visit. Stone steps, gas cooker and I think gas lighting. The radio was powered by a liquid battery which I had to take and get recharged for her. and I and my closest cousin (famous for writing the Fireman Sam stories) used to play up on the roof amongst the washing!! (and get told off for it!). Just created a new group on Facebook called ‘Our Folkestone Gardens’ where us oldies can reminisce and perhaps share photographs. There’s a great book out at the moment about Deptford/Folkestone Gardens 1921-31 called ‘Where No Flowers Grow’. My family name is Isbell and my G.Grandfather Charles George Isbell married Helen Sarah Welton and they had 3 boys (incl. my Grandfather). Helen was Elsie’s older sister and when she died in 1917 (Spanish flu) Elsie moved in and brought the boys up and although Elsie & Charles never married they had a child…Alfred Martin Russell (not sure what the surname was) in 1922. As an aside I thought her dad was Richard John Thomas Welton (aka Dicky) but seeing as he scarpered to South Africa in the 1890s I’m now not so sure. Please contact me if you’d like to swap notes etc. We were at 122 Rolt Street which was one of the properties compulsorily purchased by the council in order to create the park. The Simpsons at Folkestone Gardens were my second family, together with the McGinty family who were sitting tenants when my parents bought the house in 1964! I’m back in touch with Les and Carmen Simpson, thanks to Keith!! It would also be lovely to hear from any of the McGintys. Desmond and Bridie were my age, but there was also Francis, James and Grace. Hi Patricia,so good to hear from you!I remember those days really well and where you lived.I remember those long summer evenings playing round the backs.You had a double barrel six shooter which I really wanted and your mum sat at the open window chewing bubble gum I think?I’m still playing the bagpipes,but not on the roof of the house!I live in British Columbia,Canada in the mountains, this past 41 years with my wife.We have a daughter Robyn who is 37.Where do you live in Cornwall?We were in Cornwall a couple of years ago(mullion Cove) Do you know it?Hope we can stay in touch Christine.All the best,Gerry. I’ve just come across this page again and seen your reply. It’s so great to hear from you. I came across your reply about half-an-hour ago and I immediately went to Facebook and have set up a group called ‘Our Folkestone Gardens’. I think it will be a much better way for us all to keep in touch and to have a little reminiscence now and again and to share any photographs we might have. We’ve been living in Cornwall now for about sixteen years, in a place called Feock Village, it’s about seven miles from Truro. We moved down here from London. But I think we might be moving again up to Yorkshire. Cornwall is difficult to travel abroad from. If we want to go to the States, Australia or Canada for instance, we first have to travel up to Heathrow or Gatwick. I’d love to have a proper catch-up and hear how your sisters a doing. This is my email address: christine.shefford@btinternet.com Do join the Facebook group if you can, it’s a closed group so it will only be for Folkestone Garden people. I’m so pleased we have got in touch again. Hi Keith,just saw your letter to me and I remember you and your brother.Will you tell him that I too delivered newspapers for Newbury’s and also Frank Robertsons shop.I’ll never forget those cold mornings and those small letterbox’s! Next door to Robersons was kindreds bakery,then Margerite Evans pharmacy and Bobby’s cafe if I remember correctly.I did learn to play the bagpipes,ha ha.and still do.I also played with Brian and Gerry Gaffney Patricia Ellens,Lorraine and Malcolm Townsend,Stephanie Collier,Michael Deveraux,Frank Conway,Joey Popperwell,and Francis and James McGinty.Sorry to say Keith that Maureen Deeney passed away at a young age about ten years ago.We stayed in touch over the years.Such a shame.Anyway Keith,bye for now,Gerry. Hi Gerry am trying to locate a conway family member from new cross do u know if Frank’s dad’s name was sid/Syd? I lived at 111 Folkestone Gardens around 1939-1940 aged 5 – 6. I distinctly remember the Blitz and used to attend Trundleys Road school, which of course was later bombed. I remember being moved to the stair-wells during daylight air raids and our teacher wearing a red fire-bucket on his head (for laughs). Fortunately we moved away from the ‘Buildings’ before the V2 bombing in 1945. I would be curious to know whether or not 111 was in the blocks that were bombed. My parents, Sidney Warwicker and Winifred Murphy, lived in Oareboro Road (29?) before the war and moved to 111 Folkestone sometime before it started. I remember there was a Mr Townsend who lived next door; I have no idea whether he was related to the Townsends at No:231. I have a good colour photograph of the surviving blocks which I took around 1970 which I could send you to post on site if anybody’s interested. I looked on a 1951 OS map which shows the numbers on the blocks. The numbers missing are from 166 to 218 so you would have had a home to return to on that night. Out of interest, number 29 Oareboro Street looks like its a pre-fab on the same map so If your parents had stayed there they probably wouldn’t have bee so lucky. hi Eric,posting photos would be very much appreciated sir. I lived at 39 Folkestone Gardens from January 1945 and narrowly missed being killed by the V2 as we were in the furthest block from the blast, overlooking Oareboro Road. Even so, the blast was strong enough to blow off the bedroom door, which landed across the top of my cot! Folkestone Gardens was great community and a number of us still have a regular get together. This was originally organised by Clive Lunn who lives most of the year in Perth, W.Australia but spends about 5 months in the UK. one if you could organise it. I’ve emailed Ian directly asking if he would post the photo on this site or, if not, would he tell me your email address. I would be very interested to know the title of the book about old Deptford. I’ve had no reply from Ian to my email, so here is a possible way of getting the colour photograph of Folkestone Gardens, which I took on a nostalgia trip to Deptford around 1970. I can’t guarantee anything, but let me know how you get on. That’s a great old photo, I always wondered what it looked like. I’ve just seen your impressive flickr collection of South London photos. You’re welcome to add my photo of Folkstone Gardens if you want. I have recently discovered this site and have enjoyed reading the entries. My family and I lived at 210 Trundley’s Road from the mid fifties until 1975 when we moved to Camberwell. I recall the small shops, newsagents, chemist, baker, fish & chip shop and general store etc. There was also a community social club which my father Ken was involved with, organizing trips to the seaside, swimming lessons, street parties etc, sadly all this was lost when the area was zoned for redevelopment and families moved away, I believe that all the local pubs have also closed, Gosterwood Tavern etc. The Rose & Field families are the only ones I can readily recall. Look forward to receiving any comments. Gosterwood Tavern is closed, but still there – since 1888. Click on the link below to see this splendid old building. Have you had a look at the ‘buildings’ in my previous posting? I remember playing in Folkstone Gardens or “The new Park” as we called it in the 1970’s It had a wooden fort on top of one of the hills with tunnels (Public Toilets) running under it. All this is now long gone. Its recently been renovated and made into a skate/cycle park. I have an picture on my Flickr account which is an overlay of the modern park with the old road layout showing the houses and tenement blocks as well as the locations on the Pre-fabs. It also shows a gap in the tenements, the site of the pond where I Assume the V2 Landed in 1945. There’s a good little book called “Where No Flowers Grow: Child’s Eye View of Deptford, 1921-31” written by George Glazebrook who lived in Folkstone Gardens as a child. It’s a good read for those interested in Deptford. Its available on Amazon. Does anybody remember Freddie Vernon with his shellfish barrow & “Bill” the tramp that frequented the area with a dandelion as a buttonhole ? I lived in Folkestone Gardens from Jan 1945 until 1960 and remember the shellfish barrow but not the owners name. The Tramp was “Dog End Bill” and if you go to the Pinterest site and look up my page called Deptford and South East London you will find what is probably the only photo of him in existence. hello..just found this link about folkstone gardens with some really interesting memorys from the past and the only pic ive seen of the housing that was on the site ..wow..my parents bill and barbara rice lived there with my sister michelle before it was knocked down but im not sure for how long.. they moved to abinger grove and i moved out in 1992 but i still rembember playing in the park as a young boy also the railway arch with the iron bars on the window whixh i thought was a prison ! great times growing up there.. and i remember charlie the tramp as well amd think he was a war veteran who lost his family in the war and fell on hard times..
My nan, Lillian Slayford, and my dad, Kenneth lived at number 12 Folkestone Gardens and then my nan lived at number 47. I remember visiting my nan, going up on the roof and putting the rubbish down the shute on the landing. My mum Rosalind winterman my uncle George Wilmott and his wife Millie and her daughter Peggy were living in the buildings at Folkestone gardens when it was bombed, I was told my uncle helped people get out of the building when it was bombed, as did many others, just wondered if anybody remembers any of the people.